Are you thinking about making some spring changes in your house? Designers share the easiest and best ways to update your house for spring. The totally spring trend is everywhere. Use shades together that are a balance of warm and cool – shades of pink and blue go well together as do yellow and grey. All these hues combine with natural colours and materials easily. This spring, you can decide to throw your carpets and can get ready for a carpetless summer in your home. Less furniture and less accessory is better when we talk about more minimalism. In minimalist homes, white is preferred for some reasons. Minimalism is also a term that characterizes a popular modern architecture and design current. It’s hard to go wrong with simple black and white – but these interiors show how to do this modernistic style just right. There are minimalist style homes that use white and grey decor in varying quantities to achieve different looks and moods. Pale wood tone becomes the next most dominant colour in the room, with only a few items picked out in subtle grey tones. Make your home simple, sleek easily with some small touches. One or two plain colour is ideal when we design a home in minimalist style. 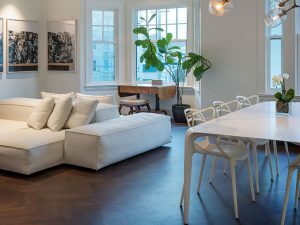 Theory of “less is more,” we need to rethink minimalism as not just a plain white box or cool ultramodern space, but as a concept that showcases exceptional functional design. This creates an artistically simplified way to live. Regardless of how you view minimalist interior design, its essential purpose and identity is to eliminate everything unnecessary.